The basics of this swap; you will cut 5 stacks of 50 2.5" squares (250 total). Each of the 50 fabrics will be unique. Swappers will be assigned 5 partners to swap with and you will receive 250 squares back in return. 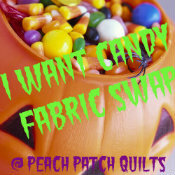 Go to Peach Patch Quilts for more details and sign up! The basics of this swap; you will swap in multiples of 100. There are a few size options, 1.5", 2" or 2.5". The 100 fabrics must be unique. There is also the option to donate to a newbie quilter, or if you are a newbie quilter and need to build up some fabrics you can sign up. Both of these swaps end on October 21, 2012 so go and check out the specifics!